David Witzling is an inter-disciplinarian moving between the worlds of filmmaking, teaching, poetry, scholarship, independent publishing, permaculture, and coding. His current interests include intellectual property and media appropriation, open source software, diminishing returns on societal investments in complexity, and the deep history of western science. His motion pictures have screened internationally, nationally, and regionally at venues such as the Ann Arbor Film Fest, Winnipeg Underground Film Festival, Oakland Underground, Festival de Cannes Court Metrage, and the Wisconsin Film Festival. 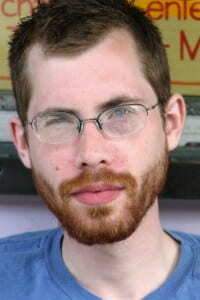 He has also been published in journals like Science and The Journal of Short Film.